Democratic debate, just prior to Texas primary, at the University of Texas in Austin, February 21, 2008, moderated by CNN's Campbell Brown and Univision. Barack Obama: Can�t do anything at home with $12 billion a month on Iraq. Barack Obama: Hate crimes related to the immigration issue is unacceptable. Barack Obama: Meet with Cuban leaders only with agenda of US interests. Barack Obama: Cuba: Loosen restrictions now; normalization later. Barack Obama: Important to undo the damage of the last seven years. Hillary Clinton: Meet with Cuban leaders only after evidence of change. Hillary Clinton: Diplomacy with Iran & Cuba, but no presidential meetings. Hillary Clinton: Would use very vigorous and bipartisan diplomacy. Barack Obama: Strong labor, safety, and environmental standards on trade. Hillary Clinton: Have a trade prosecutor to enforce the trade agreements. Barack Obama: Lobbyists & special interests have strangle-hold on agenda. Barack Obama: Consistently in favor of more disclosure around earmarks. Barack Obama: Created a publicly searchable database on earmarks spending. Barack Obama: Need a government that listens to the people again. Barack Obama: My plan does more than anybody to reduce costs. Barack Obama: My health plan does not leave 15 million people uncovered. Barack Obama: Adults will get health care as they can afford it. Hillary Clinton: Make it illegal to discriminate against sick people. Hillary Clinton: Tired of health insurance companies deciding who live or die. Hillary Clinton: Universal health care will not work if it is voluntary. Barack Obama: Unacceptable to have veterans drive 250 miles to a hospital. Barack Obama: Encourage every student to learn a second language. Barack Obama: Need to look at different aspects of immigration reform. Barack Obama: Have border patrolled, surveillance, and deploy technology. Barack Obama: Increasing the legal fees on immigrants is not helping. Barack Obama: Deporting 12 million people is ridiculous and impractical. Hillary Clinton: No official English, but keep common unifying language. Hillary Clinton: Introduce a path to earn citizenship in the first 100 days. Hillary Clinton: Consider halting certain raids on illegal immigrant families. Hillary Clinton: Border fence that cuts off a college campus is absurd. Hillary Clinton: Deploy technology & personnel, not a border fence. Barack Obama: Go beyond the divisions so that the government can work. Barack Obama: Life experiences taught me how to bring people together. Barack Obama: Actions can be seen in 20 years of my public service. Barack Obama: People understand we must bring the country together. Barack Obama: Suggesting that I plagiarized Deval Patrick is silly. Barack Obama: Wouldn�t be running if I didn�t think I was prepared. Barack Obama: I have shown the right judgment to lead. Hillary Clinton: Called by my faith & upbringing to serve others at young age. Hillary Clinton: I have the experience to be commander in chief. Hillary Clinton: My own crises are nothing compared to what people often face. Hillary Clinton: Words matter, but actions speak louder than words. Hillary Clinton: Using passages from other�s speeches is change you can Xerox. Barack Obama: Tax cut for seniors and those making $75,000 a year or less. Hillary Clinton: Rescind tax cuts for those making more than $250,000 a year. Barack Obama: $2.7 billion each week of Iraq spending is unsustainable. Hillary Clinton: Up to the Iraqis to decide the future they will have. Hillary Clinton: The purpose of the surge has not been fulfilled. 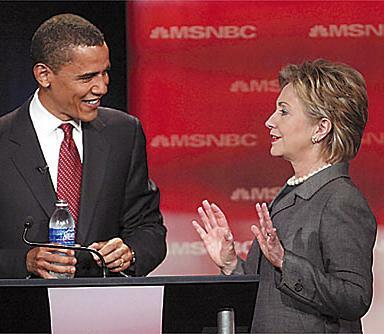 The above quotations are from Democratic debate, just prior to Texas primary, at the University of Texas in Austin, February 21, 2008, moderated by CNN's Campbell Brown and Univision. .